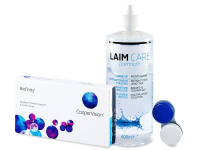 This value pack of Biofinity contact lenses includes one 400 ml bottle of Laim-Care solution and an antibacterial contact lens case for a budget-friendly price. Biofinity are monthly silicone-hydrogel contact lenses manufactured by CooperVision. Their material combines high water content with exceptional oxygen permeability, and this balanced ratio makes them suitable for extended wear (if approved by your optician).